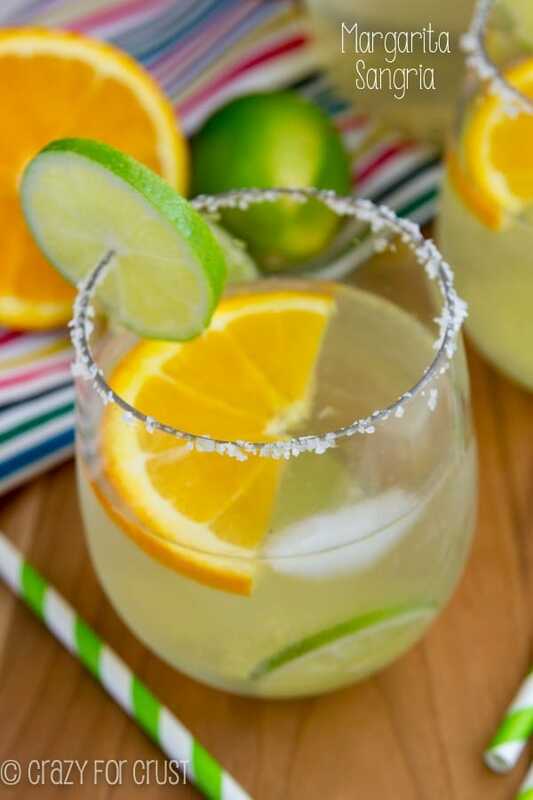 If you’re over 21 then you must rush to the kitchen and make this Lemonade Prosecco Punch for your next party. Thanks to GiltCity.com and La Marca Prosecco, I’m bringing you a simple party punch that all the adults will LOVE! Since it’s so hot, we tend to do two things all summer: we live in the pool and we get out of town often. I love entertaining, so we’re trying to have more pool parties. I love being the hostess, for obvious reasons. Every party needs a signature drink and I think that, from now until infinity, this Lemonade Prosecco Punch will be the one I serve. It’s crisp, light, refreshing and it tastes like you’re drinking juice. 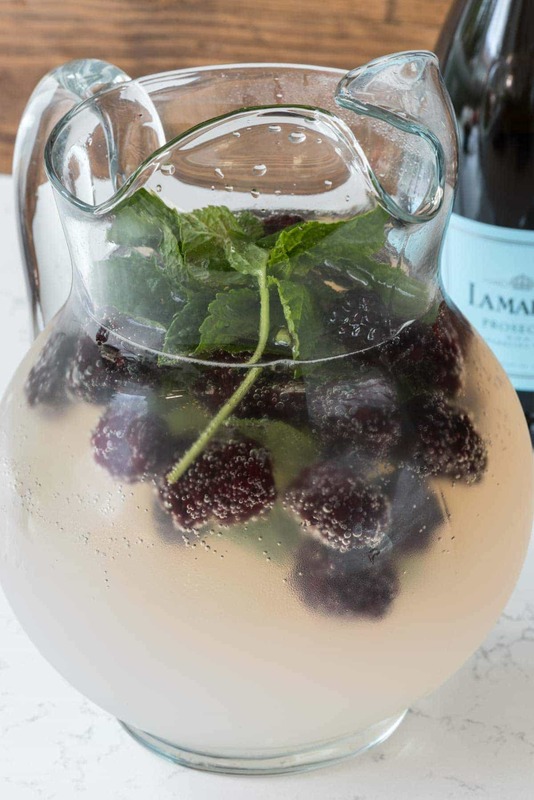 Lemonade, Prosecco, Vodka, Blackberry, and Mint – it’s a bubbly Sangria recipe that everyone is going to fall for, and it only takes about 5 minutes to make a pitcher of it! I have a thing for Prosecco; I absolutely love it. I had never heard of it or tried it until last fall and I was in love at the first sip. Prosecco is a sparkling wine that’s made in Italy. Since last November I’ve tried lots of brands and I can honestly say that La Marca Prosecco is my favorite. (I’m not alone either: it’s also America’s favorite Prosecco!) Alone, La Marca is clean and crisp and has just the right amount of bubbles and sweetness. 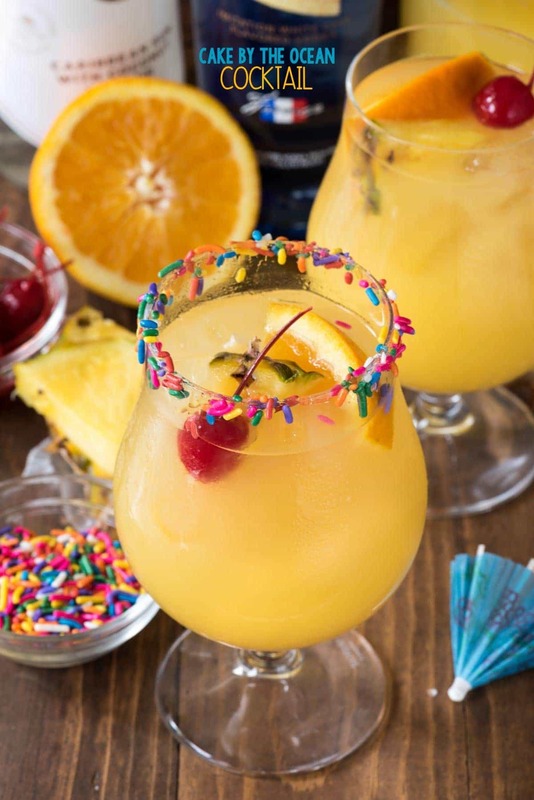 When you turn it into a bubbly Sangria Party Punch? Oh. My. Word. Make sure you make a double batch so that you have enough to go around! This drink is 5 minutes from stirring to drinking. 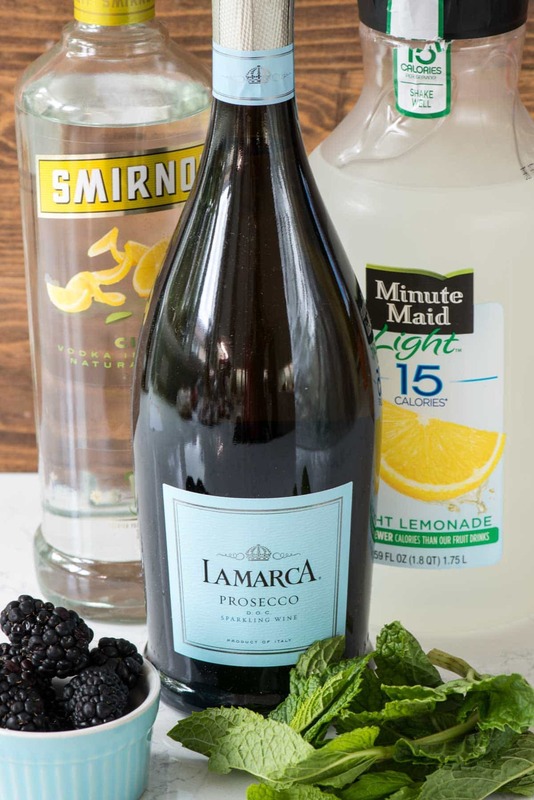 La Marca Prosecco gets mixed with lemonade (use your favorite, I like using a low calorie kind) and vodka (again, use your favorite, I like using citrus infused vodka). 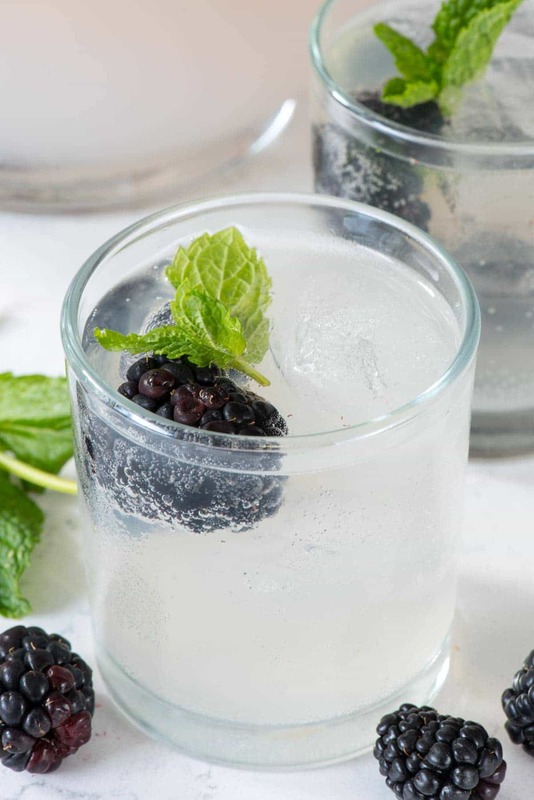 Then you add frozen blackberries to keep it cold and fresh mint for some extra fresh flavor. It’s yummy as soon as you mix it but the flavor just gets better as it sits. 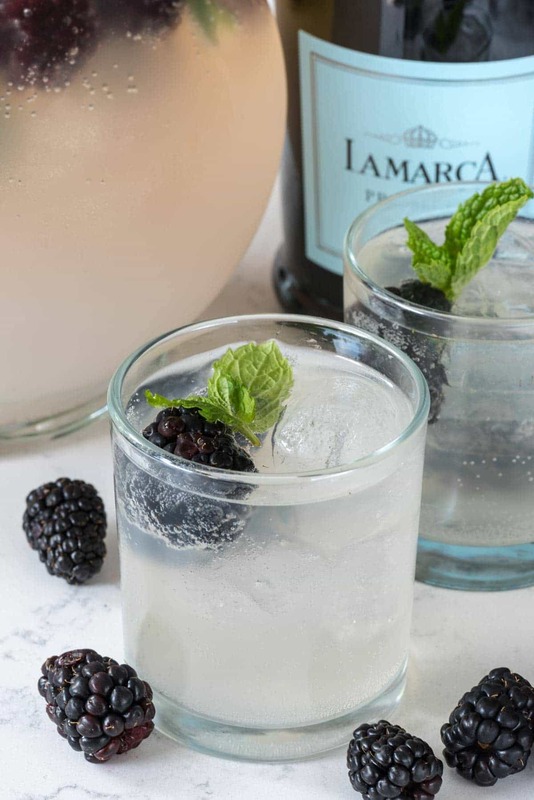 La Marca’s mantra is to make every day sparkle and this punch will do just that! Since our trips are mostly over for the summer I’m going to have to have lots of pool parties to deal with the heat. We just got back from our anniversary trip to San Francisco and if I’m being honest, I didn’t want to come home. We always find something new and fun to do in the city; someplace to walk or shop or dine. Before we left last weekend I made sure to check out GiltCity.com to see if they had any fun deals in San Francisco. Gilt City offers it’s members access to experiences in select U.S. cities, all at insider prices. If you’re looking for a fun night out or an unforgettable experience on your next trip, be sure to check them out, here: www.GiltCity.com. Also stay tuned to Gilt City in Augst for more details on how you can cool off or soak up the Miami Sun at the La Marca and Gilt City Soundtrack of Summer Pool Party! And then you should come home and make this Prosecco Punch. I’m serious, you guys. This is a super keeper recipe! Bubbles make everything better, don’t you think? Lemonade Prosecco Punch Recipe is perfect for a summer party! Just 3 main ingredients filled with berries and mint, it goes down so easy! Stir lemonade and vodka to a gallon size pitcher. Add blackberries and mint. Add the Prosecco. Serve over ice. The longer it sits the more the blackberries and mint infuse in the flavor, like sangria. Store leftovers tightly covered in refrigerator for up to 2 days. This post has been sponsored by LaMarca Prosecco and GiltCity.com. All opinions are 100% my own. I will take two! These are so crisp and refreshing looking. You the “hostess with the mostess” as they used to say! i have been drinking alot of Proseco lately, since I don’t like champagne. Actually, i think Proseco is being substituted for champagne in a lot of places. 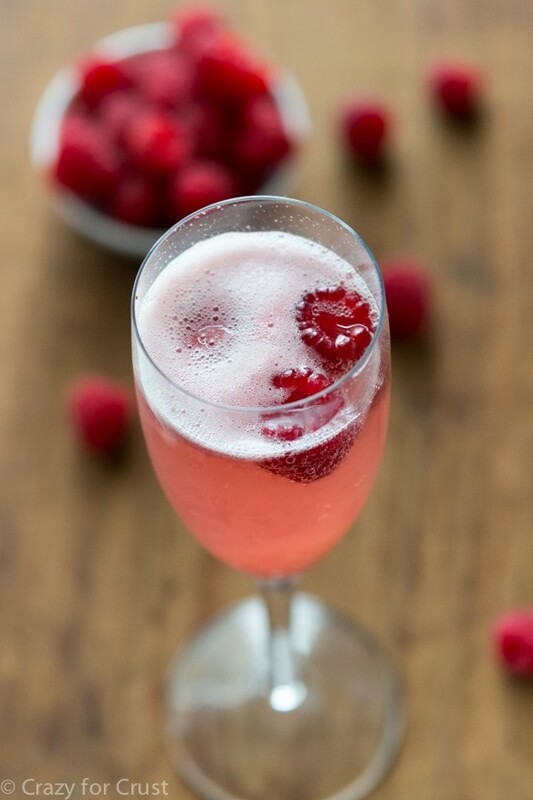 This recipe sounds wonderful and I am going to the beach in two weeks and will get case of Proseco from Costco and we’ll just toast “Dorothy, Dorothy, Derothy” as we swig it down! Thank you for a wonderful recipe. I will share with your blog. This is so pretty! I’ll leave the vodka out, I can’t drink it. But the rest for me is so going to be made! Wow! A perfect signature drink especially for the pool parties in summer. Refreshingly chill. They look really tasty and colorful. Definitely must be very good beverages. Thanks for sharing! Can you be more specific about how much lemonade to use please. I have a question. Do you suggest making this the night before a party as you would do with a sangria for best taste? Or does it not matter. Thank you! !